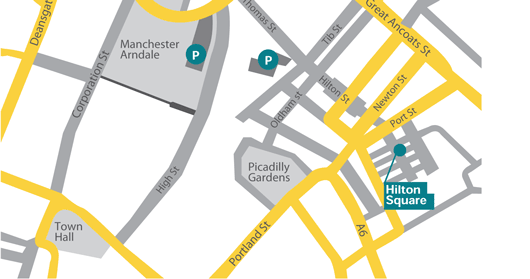 Hilton Square development occupies a prominent site bound by Hilton Street, Tariff Street and Brewer Street in the Northern Quarter. The Northern Quarter has benefited from extensive redevelopment over the last five years and provides a unique setting for a range of creative, design and fashion sectors. Hilton Square is very well connected to nearby public transport links. Piccadilly Railway station and Piccadilly Gardens, the cities main bus and Metrolink interchanges, are both less than afive minute walk from the development. The development is also within five minutes from Manchester's financial and retail cores.